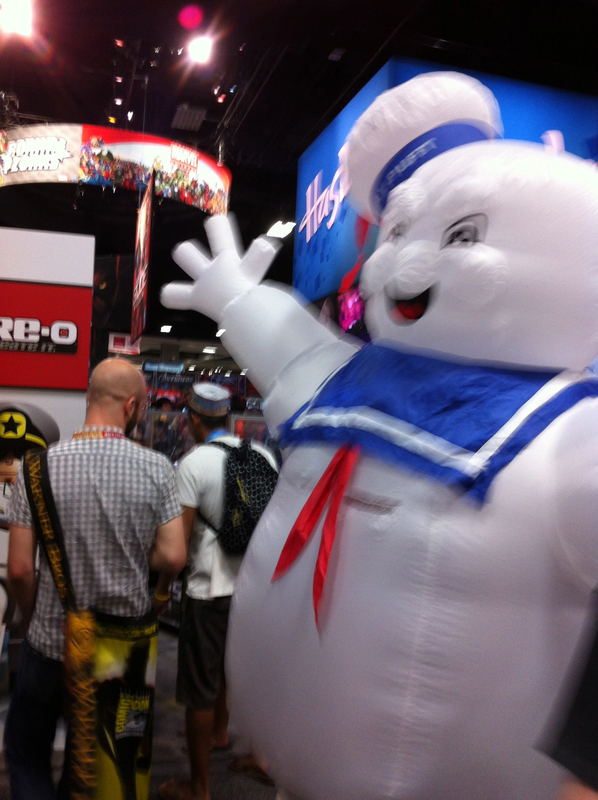 Here’s a quick over view of SDCC 2012 for Max Toys / Mark Nagata. Over all it was the best convention I’ve had, although with hindsight impossible to fit all I needed too into one day, mixing business with personal stuff. 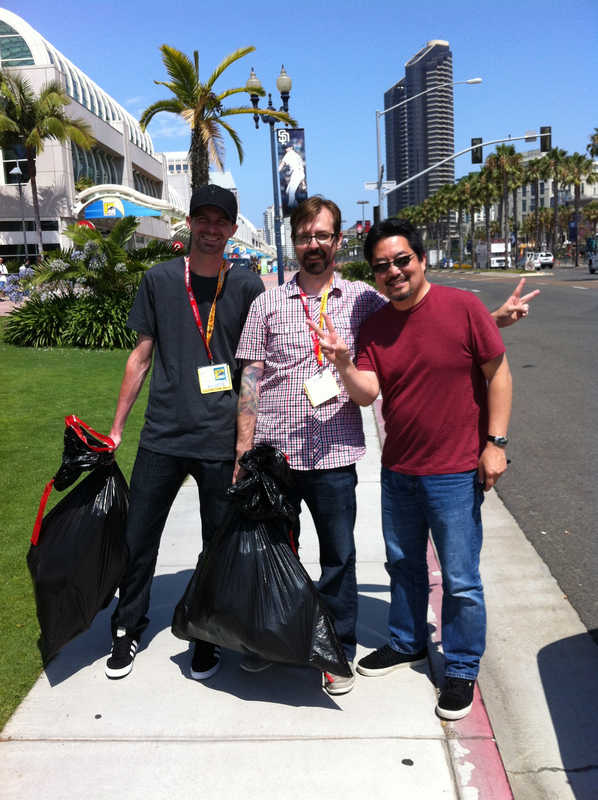 I was only able to get a one day pass for Thursday so i needed to drop off my customs and exclusives with Rotofugi ( Ed on left and Kirby the owner in the middle ) on Wednesday driving straight from the airport. The following day we decided that taking the train from where my sister lives was a good idea, thus eliminating the search for parking. I’ve never done this, but let me say it’s easy to do and gets you about 10 blocks away from the center. A bit of a walk if you have lots of toys to haul ( which we did later on ! ). 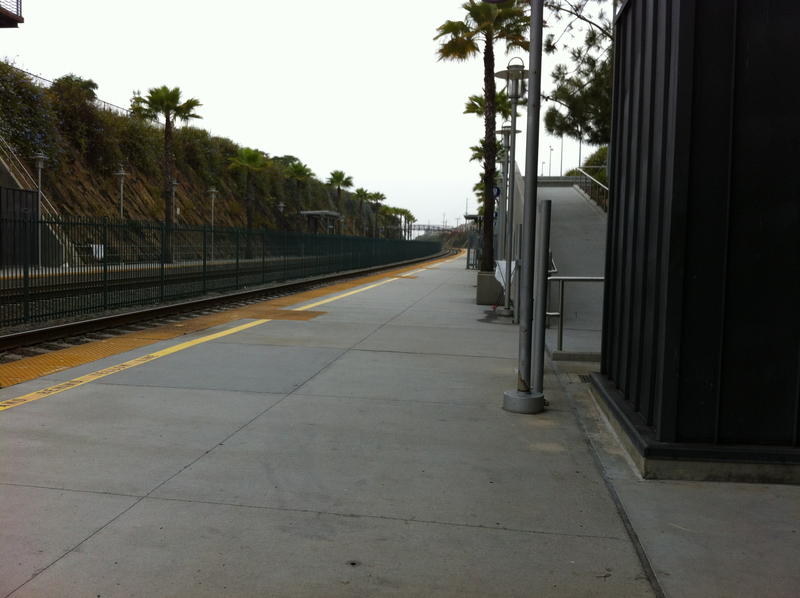 I don’t think I’ve taken a train in decades but the ride was smooth and comfortable. 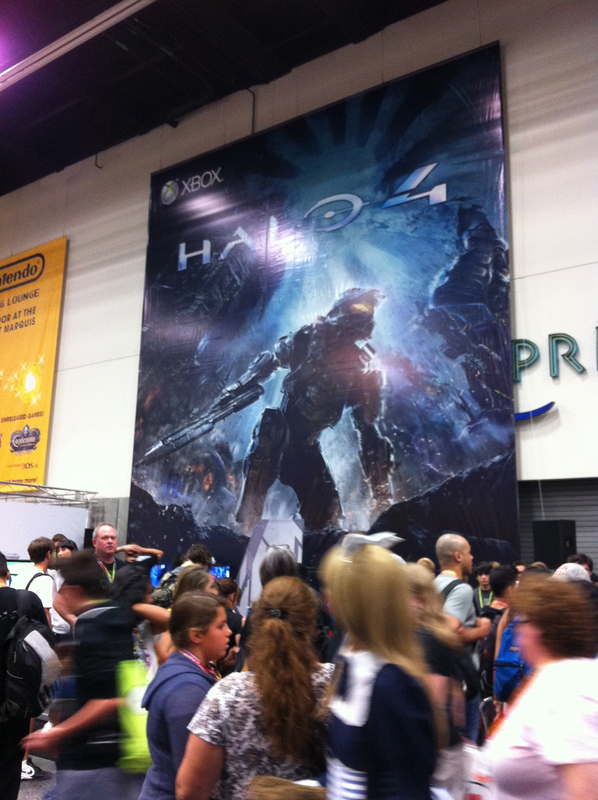 Once we got to the convention site we had to walk around to the back to line up. 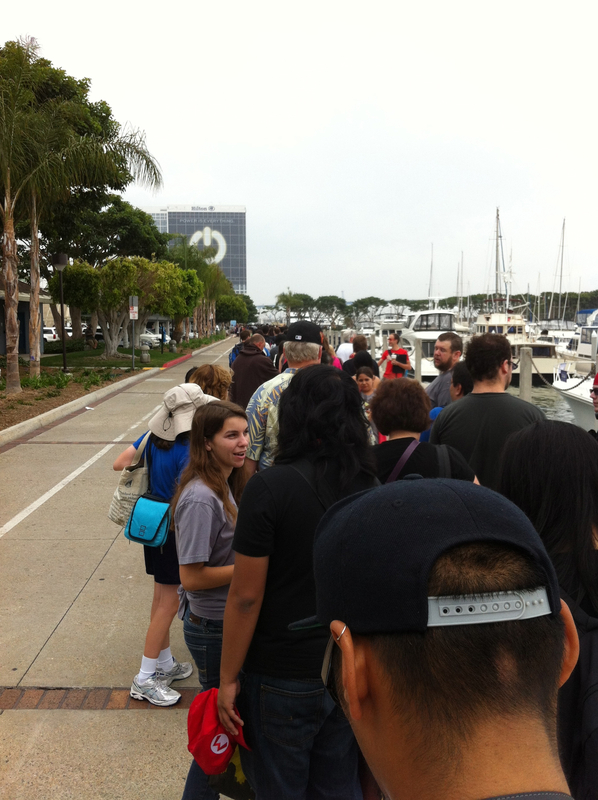 The line stretched all the way back to Joe’s Crab Shack … lets just say that’s really far away (!!) But the line kept moving so it wasn’t too bad …until the line reached the front of the building ! This is where everyone is walking in and out of the front doors and the line suddenly disappeared in front of us, mixing with Press pass folks and misc attendees. Total “Fail” in my book as we could see folks skipping the line up behind us and jumping in line. 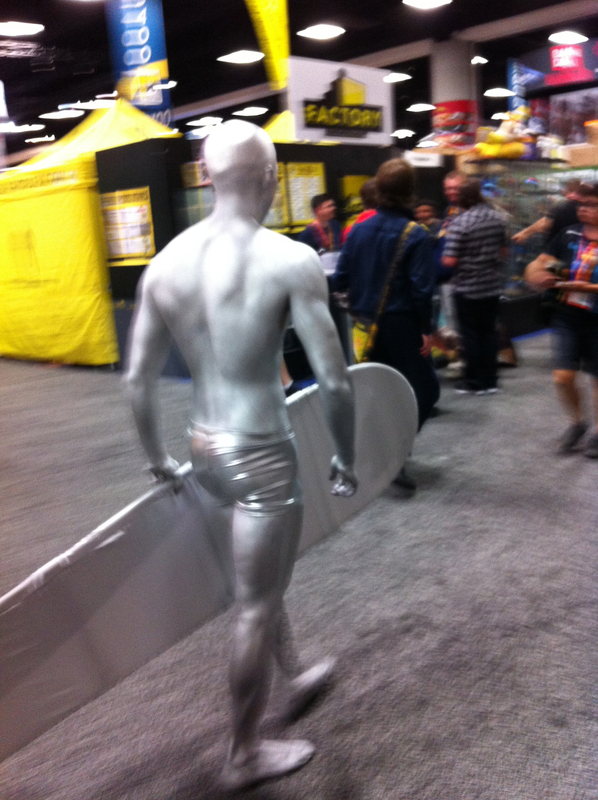 Ah well .. so it goes … Once inside the process is quick to get your badge. They asked to see my ID twice, which I thought was odd since the first guy marked off my printout after checking my ID .. but whatever .. oh and they did this for Max, too. 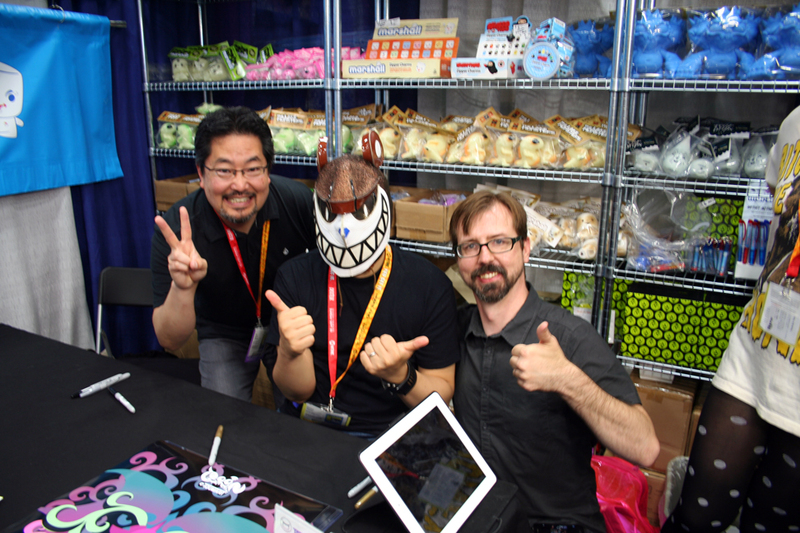 We had our list of booths to check out and I had two signings lined up so we decided to start at one end. At this end the rows are in the hundreds and this is what i call the older booths .. or whats left of the old Comic Con .. having mostly toy dealers and actual comic book dealers. 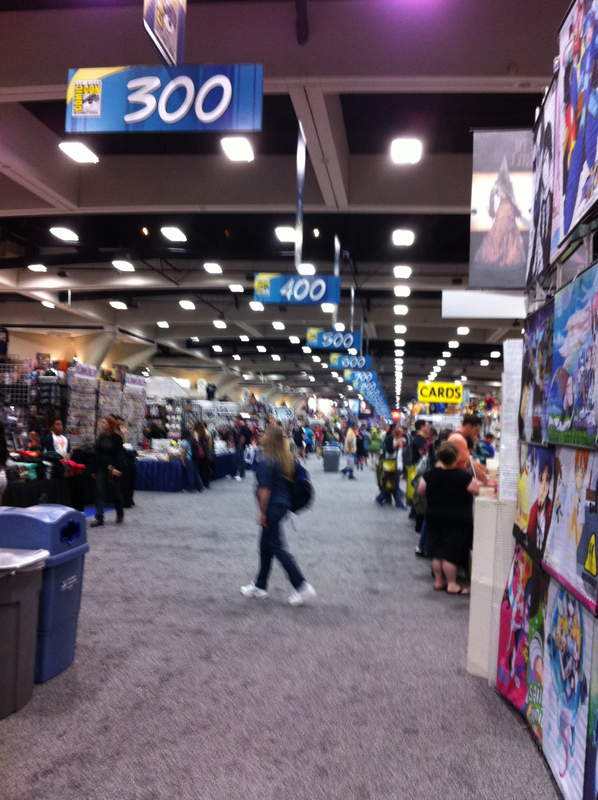 I enjoy this part of the hall best … I especially like looking at the original comic and illustration booths. The Mondo poster guys were here too and swamped .. so Max and I passed on waiting in that line and kept moving like sharks. 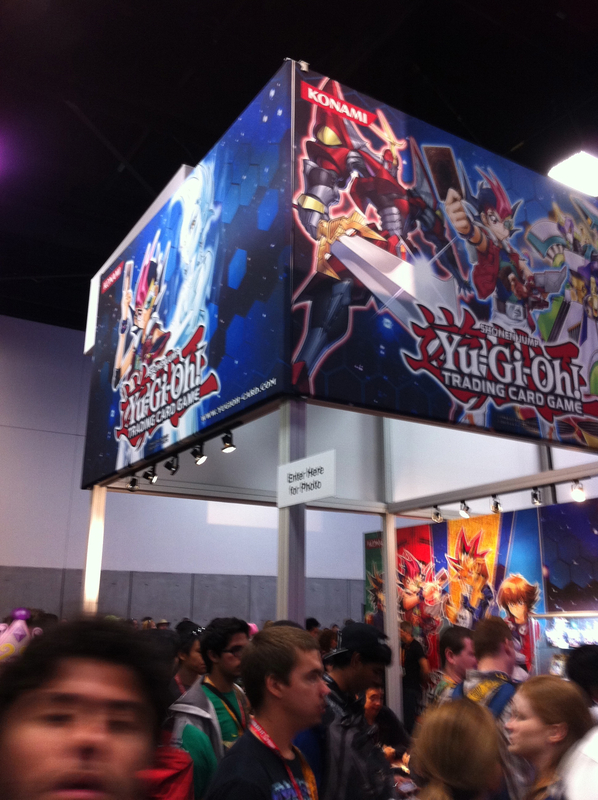 Of course, we made our way to the Konami booth who makes Yu Gi Oh cards. Too bad they didn’t have any SDCC exclusive cards .. but still they showed all the releases for the rest of the year which got max excited .. and I could only calculate the cost to me to come ! Good thing Max is with me .. he looked at his watch and said, it’s 11am .. don’t you have to sign at Rotofugi ?!! Oops … we quickly made our way from row 900 to 4700 .. which takes awhile having to dodge people… Making it in time I learned that all my customs had sold out on preview night 0_o ! Whoa ! 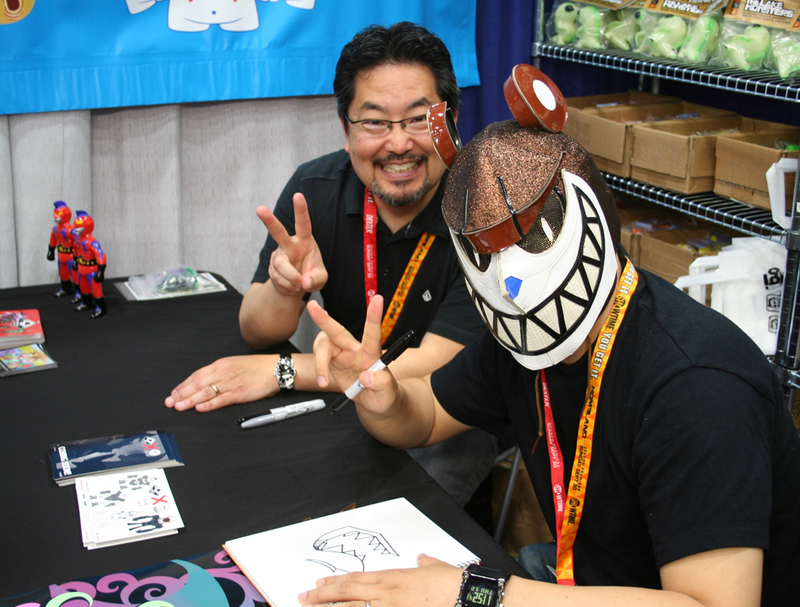 I don’t get to see Max Toy fans much since i run everything via my web site so it’s always good to put real faces to online names. 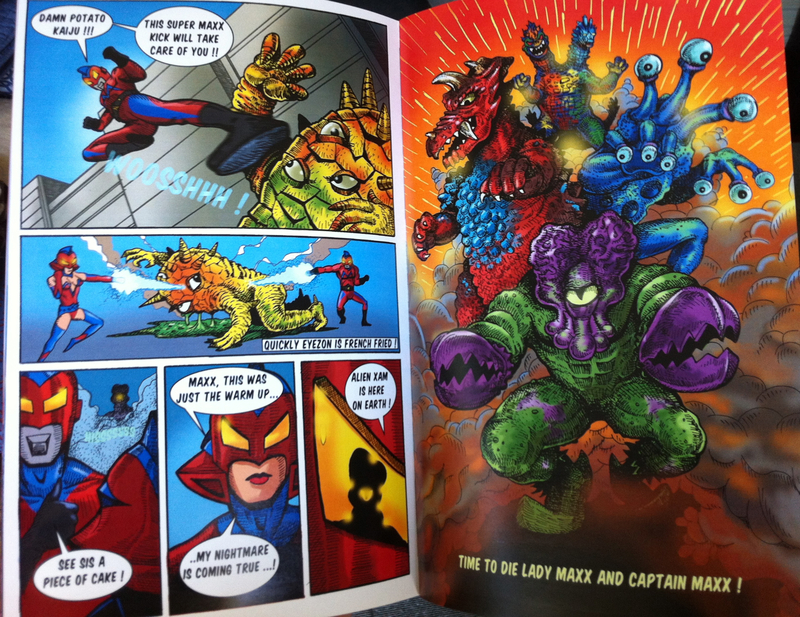 While collectible toys are what I make, I did manage to make this Lady Maxx comic book which I think over all turned out great and to release an actual comic at Comic Con … haha … was fun to do. 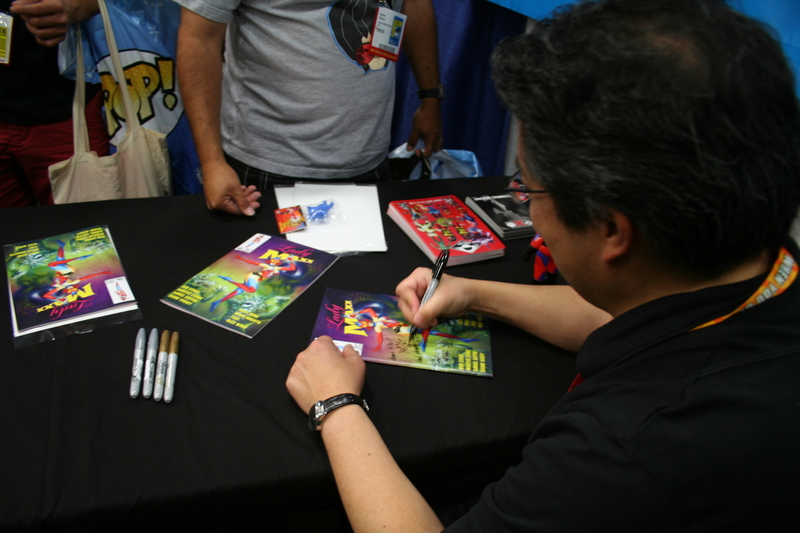 Midway through artist, TOUMA joined me as we gave out postcards showing our upcoming project. 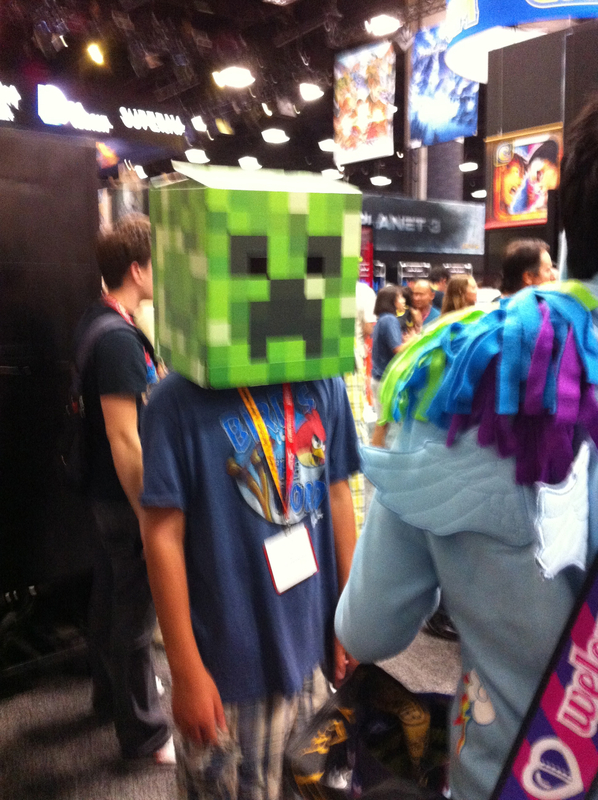 We wondered if he’d show up with mask or without .. of course with mask ! 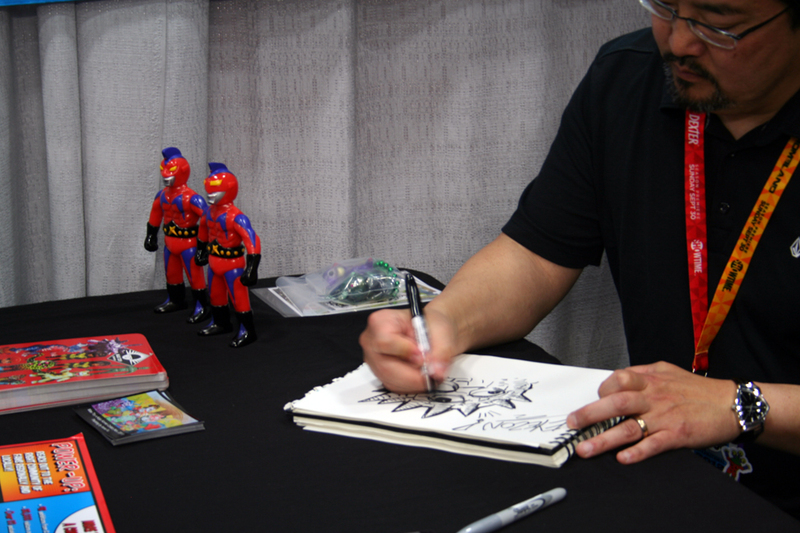 Always fun to do sketches for the fans .. you can see the new Max Toy x Frenzy Captain Maxx’s there too. 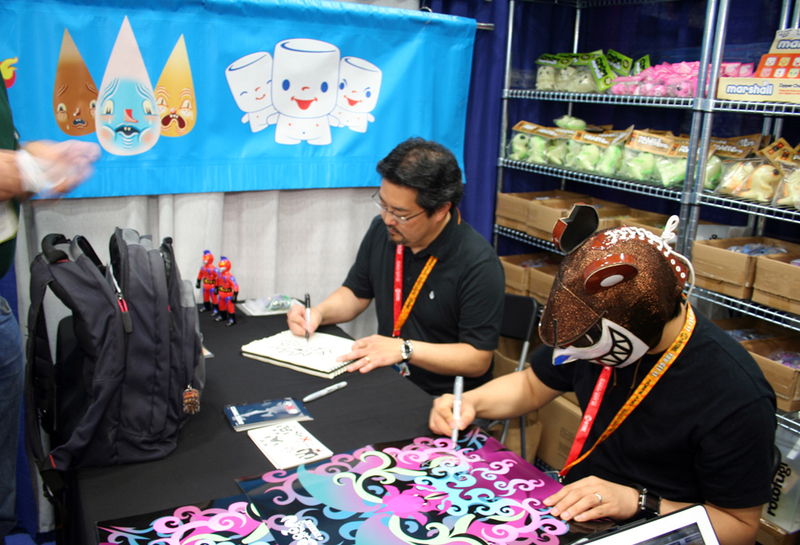 With that we wrap up another terrific year at the Rotofugi/ SquibblesInk booth ! Many thanks to Kirby, Joe and Ed for hosting myself and TOUMA. 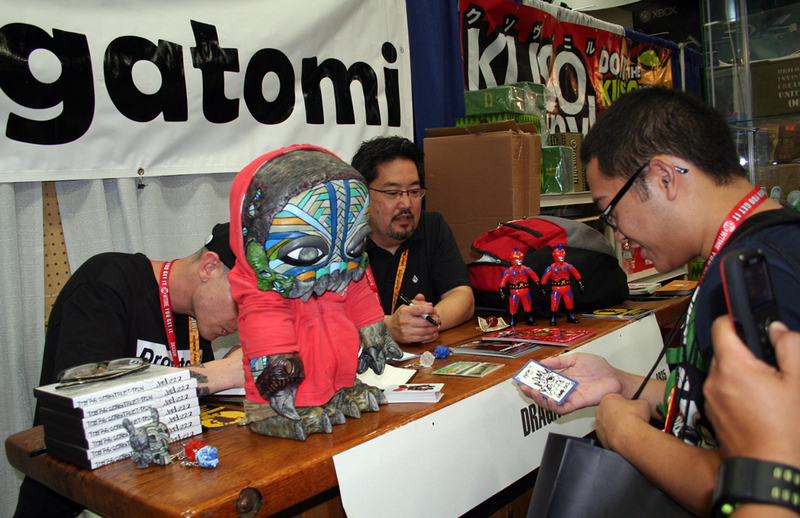 And I’ll be in Chicago October 2013 for Toy Karma 4 !! Geez, can you believe the 4th one ? we do them every other year, too …. The next signing was not till 5pm but as anyone knows, hours can go by like minutes .. in between wondering around, had a few quick meetings, stood in line only to find out what Max wanted had sold out for the day ( waste of time )… grabbed a quick lunch … had to sit a bit to rest … and actually left the center to get some air and ice cream …. 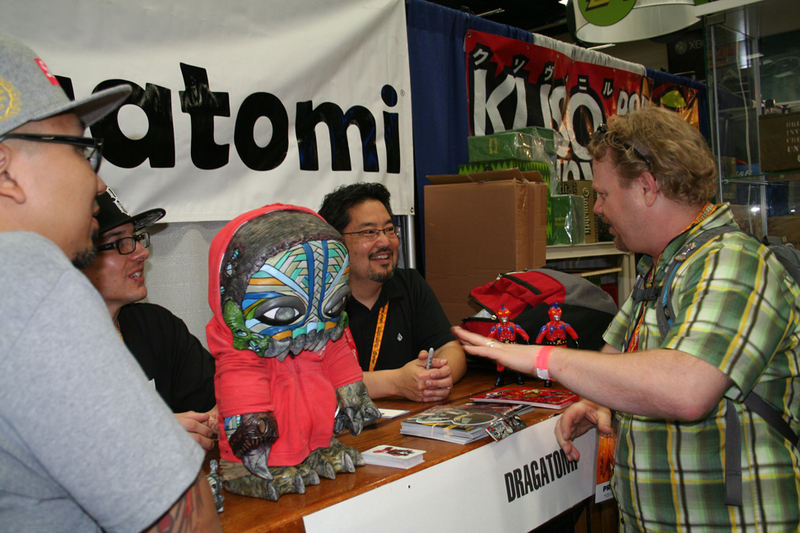 Finally at the Dragatomi booth for a signing with Jay222. As plans go we were suppose to have test shots of Jay’s new figure, Lady Vengeance, along with Troy Stith’s new figure Yuudoku. But they had not arrived yet .. so I was not happy about that, but what can you do ? The show must go on .. Dragatomi had these great signing cards so both Jay and I were able to use those to sketch for folks. 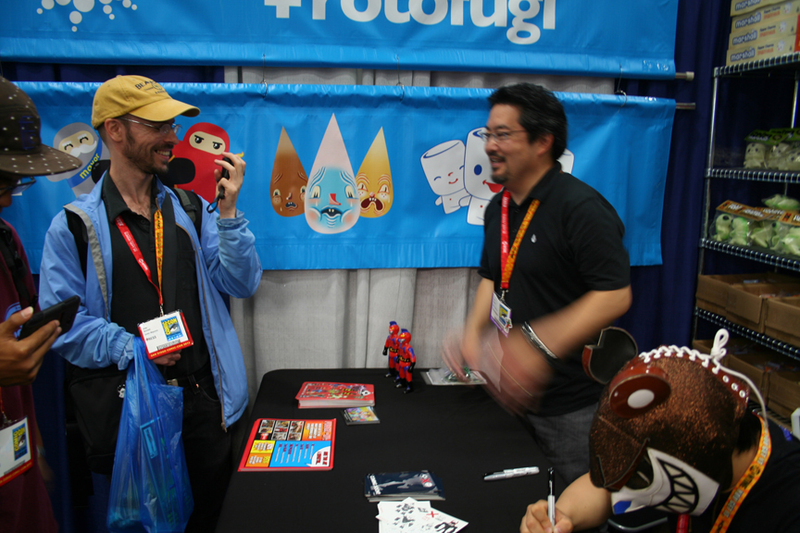 Above the legendary Jim Crawford, of StrangeCo and Clutter stops by to say hello and pass out postcards. 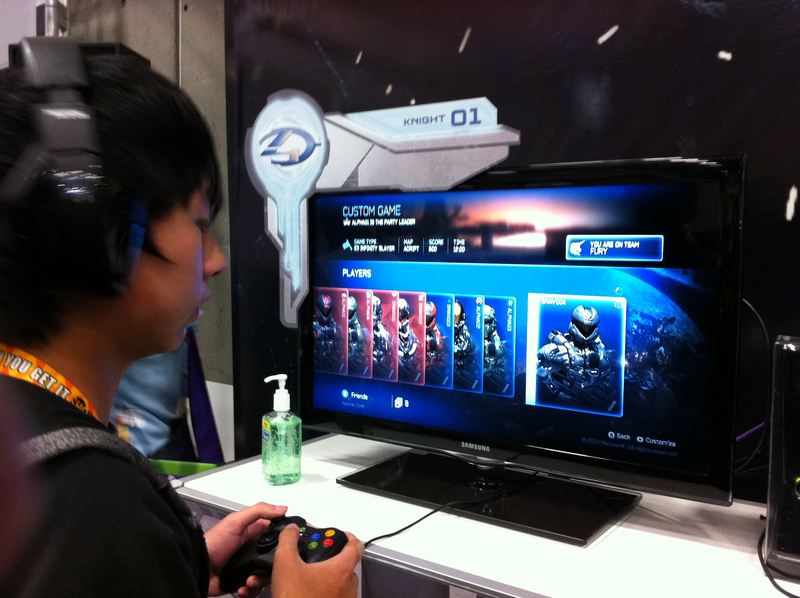 When the demo was over ( which I videoed for him ) he said it was simply awesome ! and yes we have already pre ordered the darn thing plus might have order a deluxe edition too ! So that was it for 2012 … both Max and I were beat and I just couldn’t move any more. We slowly made our way to the train station with our haul and agreed to fit all that into one day was crazy. Phew … I’ve said it before but I had planned to take 2012 a bit easier and space out the various events and releases but it’s turned into the busiest year ever for me. The rest of the year is full, we have more new toy releases, collabs, I’ll be in several more shows, I think putting on another one at Double Punch and much more ! Thanks again for the support and see you soon !